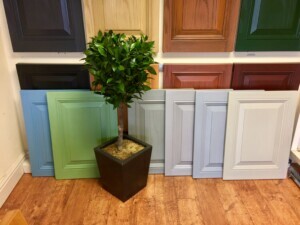 Just in, a range of GRP samples representing the recently most requested colours. GRP (fibre glass) garage doors can be manufactured in other RAL colours so if you can’t see one you like we can always have a garage door produced in one you do. Tip 1 – Please let us know if two garage doors of the same colour are to be fitted in close proximity to each other so that any colour variations can be kept to a minimum. Tip 2 – Just remember that when trying to match garage doors with UPVC products always check a colour sample first. For example Rosewood GRP doesn’t match Rosewood UPVC where Dark Mahogany GRP is much closer. Feel free to pop in to our showroom on the A217 Banstead – our team will be happy to help with your colour selection and give you the best advice.